The relatively new field of User Experience Design is a great choice for someone looking to break into the tech industry. UX Designers are in-demand, career satisfaction tends to be high, and it’s a great job for telecommuting. No surprise, then, that CNNMoney ranked UX Design number 14 in its 2015 list of the best jobs in America, with ten-year job growth of 18 percent. In its simplest definition, User Experience Design is the design of those perceptions and responses. But it’s obviously more than that. This encompasses a wide variety of skills, and while some complain that the broad definition of UX Design should be more specialized for clarity’s sake, it allows for a low barrier to entry for a vast range of qualified candidates. This increases the chances for a great graphic designer, for example, to nab a position, and it also allows employers to scoop up undiscovered talent. Another important thing to keep in mind: UX Design isn’t all about the user. A UX Designer needs to also focus on the business goals of the organization he or she is working for. In order for the user to feel good about the company, to buy that product, to choose that service, their experience using the product has to feel good. – Translate concepts into wireframes and mockups that lead to intuitive user experiences. – Facilitate client’s product visions by researching, conceiving, wireframing, sketching, prototyping, and mocking up user experiences for digital products. – Design and deliver wireframes, user stories, user journeys, and mockups optimized for a wide range of devices and interfaces. – Identify design problems and devise elegant solutions. – Make strategic design and user-experience decisions related to core, and new functions and features. – Take a user-centered design approach and rapidly test and iterate your designs. – Take smart risks and champion new ideas. Let’s take a look at some of the key qualifications for UX Designers. From recent job postings for UX Designers, 61 percent of applicants need a Bachelor’s degree. 37 percent of UX Designer postings require no degree. 18 percent of UX Designer postings require a Master’s degree, and 1 percent of job postings are looking for a candidate with a Ph.D. 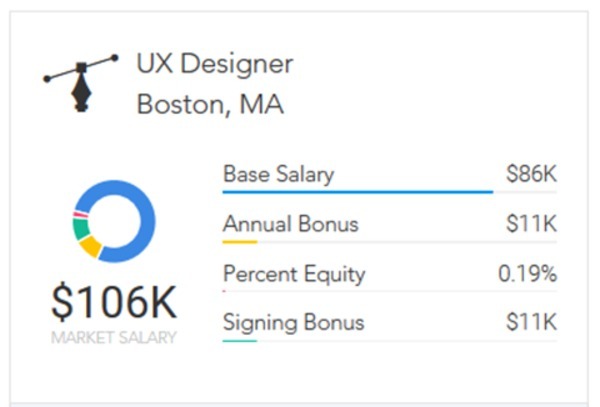 The skill set required for UX Designers is as broad and varied as the job description, but recent job postings reveal a common set of qualifications that are frequently included. Scott Jenson: 25 years of experience in UX and UI (User Interface) Design is nothing to shake a stick at. He’s worked for the big names (Apple and Google) and holds over 20 patents. In addition to following him on Twitter, you can check out his website, which includes a blog and videos of his speeches. Julie Zhuo: Product Design Vice President for Facebook. Need we say more? How about: she started when she was 22? She also shares her insights on Medium. Taylor Ling: If you like using Google and Android, you should probably add Taylor Ling to your list of greats. He’s a Professional Android Designer and a Google Development Expert. He’s the author of Android UIUX, which is chock full of design expertise. Matias Duarte: A combination of what’s interesting about the previous two. Duarte is Vice President of Design for Google. Definitely someone to follow! Adham Dannaway: Dannaway is a UI/UX Designer and Front End Developer living in Sydney, Australia. His Twitter feed is full of daily design tips and resources. And finally, two additional resources on Twitter. @UXFeeds is a syndicated feed of related articles, so you can be sure not to miss anything. And Peter J. Boagaards @BogieZero is a self-proclaimed infophile and content curator of “all things experience design.” The feed is full of valuable design tidbits from across the web. Special Interest Group on Computer-Human Interaction (SIGCHI): This organization offers an annual conference, publications, communities, email discussion groups, and more. 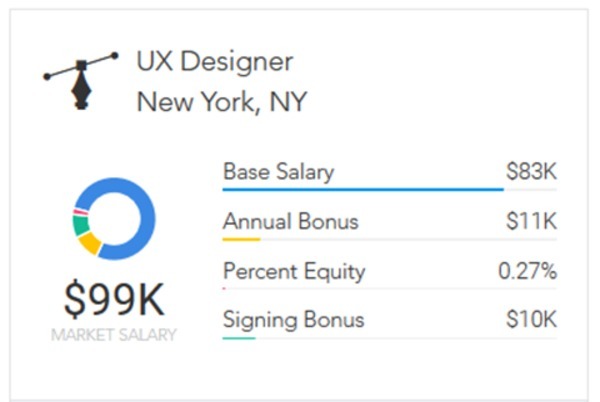 Based on 5,800 profiles, UX Designers earn an average market salary of $113,000 per year, ranging from $66,100 to $166,000. Average market salary includes $89,000 base salary, $16,000 annual bonus, $11,900 signing bonus, and $33,500 in annual equity. 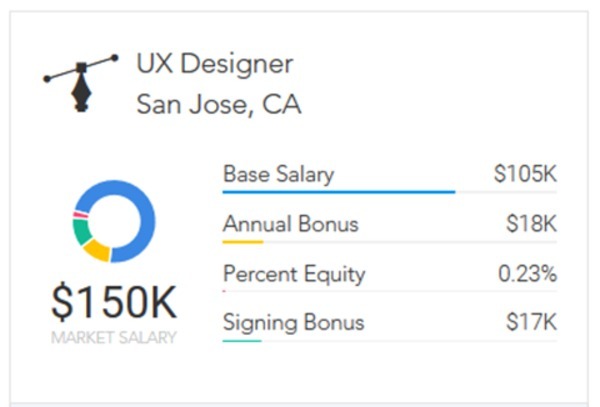 The time it takes before you can expect a promotion varies by company, but it takes an average of between two and three years for a UX Designer to move up at one of the top tech companies. 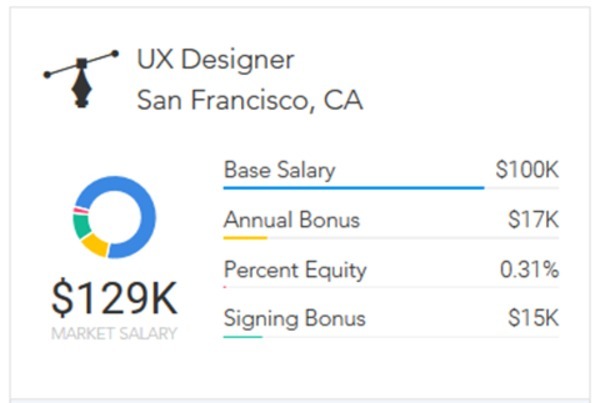 For example, it takes an average of two and a half years for a UX Designer at Amazon to be promoted, and an average of three years at Google. A UX Designer stands to benefit greatly as we approach what the press are calling “the decade of design.” The name of the job may change, the field might become more specialized, but an expert in how a customer feels when using a company’s product or service, someone who can turn good feelings into profit, that person will never go out of style. 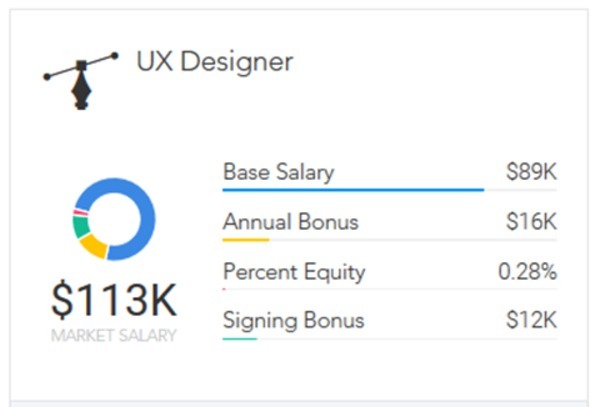 If you’re considering a career in UX Design, Paysa can provide personalized job recommendations, skills recommendations, and compensation information that will help you negotiate a job offer or secure a raise at your current position. Visit Paysa.com for more information.